first thing that grabbed me about the B* was just how broad the palette of sounds is from such a small box. it's been said before, but you really have to exercise a subtle approach to the knobs to avoid going into galactic territory. this thing can get crazy pretty fast. and there are so many options for introducing different types of crazy into the mix. lots and lots of fun. the filter sounds really juicy, with the res up you get some lovely timbres that cut through the mix nicely as you would hope for with a synth with 3003 in the name.. it definitely has the ability to go retro, but it's also really adept at coming up with totally fresh and funked up sounds too. i'd really like a chance to try out the 4075 now as that was my favorite filter in the atc. I am so thrilled with the 3003 and the SEM combination. I mean playing them together. The contrast between the 2 is really good and you shape a few harmonies, chords and texture, out of this world... Especially when you start putting some FX on them (or even on only one of them.) Delay and reverb. Can't wait for my new 4075 even though I know in my heart that I may want to keep the 3. (Thank God I haven't tried the Moog!!!!). Yet! Good night everyone. And we could all thank God for the gift of music and the ressource to be able to afford them and inspire our kids! I got the Moog version a few weeks ago (but haven't had much time to play with it). I saw they were in stock on Schneider's, walked in on a Friday evening and had instant GAS -- they had the Moog and 303 filter versions and realized if I don't grab one now I may have to wait 6 months for the next chance. There were two things that sold it to me: a) a very badass overall sound, and b) modulation/routing options that can make it sound even more badass. Osc2 to Osc1 freq can be quite unpredictable, and I tend to keep a short patch cable ready so I can feed the Osc Out into Ext In on a whim. I should totally make a demo video of it, when I'm a bit less busy with current projects. This synth is really deep. I decided on and bought the Boomstar 4075. Been playing around with and really like it. I personally like all of the Boomstars. Owning an ATC-Xi, I knew I would. They are all equally intriguing. From the get go, the 3003 and SEM interested me the most. I didn't hear enough of the 4075 to hear it's full range of sounds, so that had quite interested as well. Which is why I wanted to get it. The oscillators sound great with the filter wide open. The modulation paths are useful and cool. All the other stuff on the box is well thought out. What I'm saying is - you can't go wrong and you'll probably end up picking up more than one. Decide what filter flavor most interests you first and pick that up. None of them are wrong and none of them are particularly limited. If you're keeping track, I purchased the 4075 and am on the list for the SEM. Got my 4075 yesterday and spent about 4 hours getting acquainted with this synth. After a cautious start, checking out the general flow of things, I became totally absorbed in it and lost track of time. This thing feels alive. The way the circuits interact with each other is something special. There's so much variety in the sounds it can produce; from soft, lush traditional leads and warm, rounded basses through to insane, brain-shattering chaos. Even after building a beastly eurorack modular and with the Telemark next to it, the 4075 shines very bright. It's incredible how they managed to fit so many features and such tweakability in to such a compact synth. A massive achievement in design. Well worth the wait. They've created a beast. @Studioxchange Get promoting that Boomstar 3003 of yours, it's a beast! Here's my first 10 mins with it - https://t.co/fJzIwuNtxm"
"My first 10 minutes with the @SE_BoomStar 3003. This thing is brutal. Video when I can tear myself away. Listen at https://t.co/eUEo2qpcWp"
"Studio Electronics Boomstar 3003 is a wild screaming banshee. Video coming soon." My Boomstar arrived today. I opted for the 4075 version mainly because I already have a 303 and a MiniMoog. Summary - drop everything and buy one right now. This box is amazingly fun to tweak. Basics - oscillator shapes sound great with the filter wide open. The sub adds a nice low punch. The filter sounds good to my ears, but I'm not commenting whether it nails the ARP sound or not. Basically I don't care. It does the things it is supposed to do - cutoff and resonance are pleasing and interact well with the modulation sources. loop and invert on Env 1. Do this - loop the envelope, route it to mod VCO 2 frequency. Set A/D/S/R all to zero. Slowly bring up the decay a bit then play around with the sustain knob. Sounds chaotic - now flip the oscillator sync switch. LFO rate has a nice range and a great selection of waveforms. Env 2 can be triggered by the LFO - very nice. It's good to see designers paying attention to AM possibilities rather than just the standard filter mod. The feedback and ring mod do good things to the overall sound. The knobs and switches have a great feel to them. The layout and switches really lend themselves to playing this as an instrument. My suggestion is to put this someplace where you'll easily be able to reach the controls. I can definitely see people rocking these things live like they used to do with the 303's back in the day. Other quick notes - I was triggering it from MIDI and it was as fast as my TB-303 being triggered from cv/gate by the same sequencer with parallel sequences playing (Cirklon). Haven't done any cv/gate testing yet. The box is small, but there's room for my large fingers to get to knobs and switches without inadvertently bumping something else. Very small wishlist - power switch, white indicators on the small knobs across the bottom. Sometimes with a lot going on it's hard to tell if feedback, ring mod, or something else is contributing to the sound and needs adjusting. Like I said - very small list and if I really care, I can put a dot of nail polish or paint on the knobs. Right now, it's a ton of fun in a small box. I had an SE-1x for a while and even though I really liked the sound, the menus were a buzzkill. This box is perfect in the balance between amount of functionality and ease of use. Like other manufacturers found out - take a great sounding core, add the ability to modulate the core in different ways, and allow the modulations to interact in unexpected ways and you end up with a winner. All I can say to the previous posters on the prior 46 pages is to try one in person before knocking the featureset. Will I end up buying a second box? Maybe, maybe not. We'll see if the glow wears off after a while. Do you need at least one? Definitely. Does it really matter which filter you get? If you have a lot of other gear, I'd say no. If you really want something *in the particular style of* ARP/Moog/Roland/Oberheim, then yes, maybe it matters. It's really the rest of the box that makes it special. Hi Marc, I got the 5089 two days ago. My initial reaction: it sounds absolutely divine!The feature vs the sound vs the price is unbelievable. The Boomstars deserve good promo to catch the awareness of all synth loving musicians. Some of the knobs wobble a bit though (like on my Minibrute). I will be making some demos now. Can you email me the full invoice when you have time? Many thanks. Initial reactions to the Boomstar 3003 - first off, the thing is built like a tank. I like that in a synth. This carries forward the build quality that I have admired in my SE-1x. Once you are face to face with it, you realize how small they have made a 2 VCO monosynth. The controls are close together, but they still work, even with my big hands. Sound wise (only speaking of the 3003) very rich and powerful. I would say it's more versatile than my Minitaur as far as the sonic ground it covers. The filter is not just a 303 filter, but a very distinct and musical component. You can get "that" sound out of it true enough, but what you have is a superset of what an original 303 could do. Well worth the wait, and the fun factor on this thing is through the roof. Once again Studio Electronics have taken classic, well-loved circuits and evolved them to a higher place. I will try to put together a tiny demo track this weekend if I can find time. It's a very inspiring little synth. 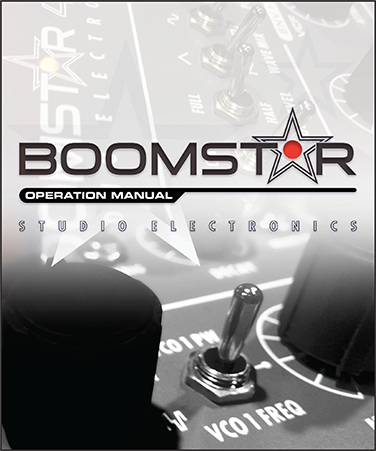 BOOMSTAR SE80 BOOMSTAR 8106 BOOMSTAR 5089 BOOMSTAR 4072 BOOMSTAR S.E.M.